The mightily-impressive OnLive Desktop app is offering Windows 7 to iPad and Android tablet users without Microsoft's permission, Redmond says. OnLive Desktop brings virtual access to the Windows 7 desktop, including marquee apps like Microsoft Office and Internet Explorer, over OnLive's cloud servers. Until now, it was unknown whether the company had Microsoft's blessing. It doesn't, but talks have been opened with a view to rectifying the situation. 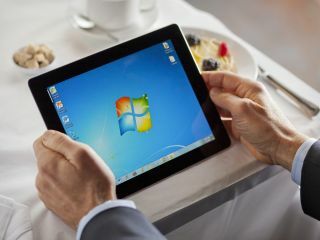 In a blog post on Thursday, Microsoft's corporate VP of Worldwide Licensing and Pricing, Joe Matz, said users of the app must also have their own Windows license. "We are actively engaged with OnLive with the hope of bringing them into a properly licensed scenario, and we are committed to seeing this issue is resolved. "Customers that want to work with partners to have them host Windows 7 in a Virtual Desktop Infrastructure solution on their behalf, can do so when the customer provides the partner licenses through the customer's own agreements with Microsoft." Microsoft hopes that "partner" will be OnLive, but at the moment that's not the case. This interesting situation is definitely one to keep an eye on.